Growing Up in Working Class Youngstown — James L. Wick, Jr.
Rocky Ridge was a favorite area growing up, whether it was playing on the playground as a child, sledding down the hill below the play area in the winter, playing baseball on one of the diamonds, touch football, or tennis on the tennis courts. As a teen, I was at the skating rink every weekend during the winter and I have memories of going to open air concerts. The one that stands out featured jazz great Lionel Hampton–something I didn’t appreciate at the time! Formally, the name of this place is the James L. Wick, Jr. Recreation Area. We never called it that, and I have to say I was oblivious to who this gentleman was. In researching him, I found out that I walked by his home on 384 S. Belle Vista (I believe on the corner of S. Belle Vista and Chaney Circle) every day when I went to and from Chaney. The home itself has some history to it, being the original home of Samuel Price, a prominent West Side resident (think Price Road, which is practically across the street from this home). Wick and his wife Clare purchased the home in 1919. Wick was born into the Wick family, Youngstown royalty of sorts. His father, James Lippincott Wick was a business partner of Freeman Arms (James, Sr. married Julia Arms) and was also associated with G. M. McKelvey’s. 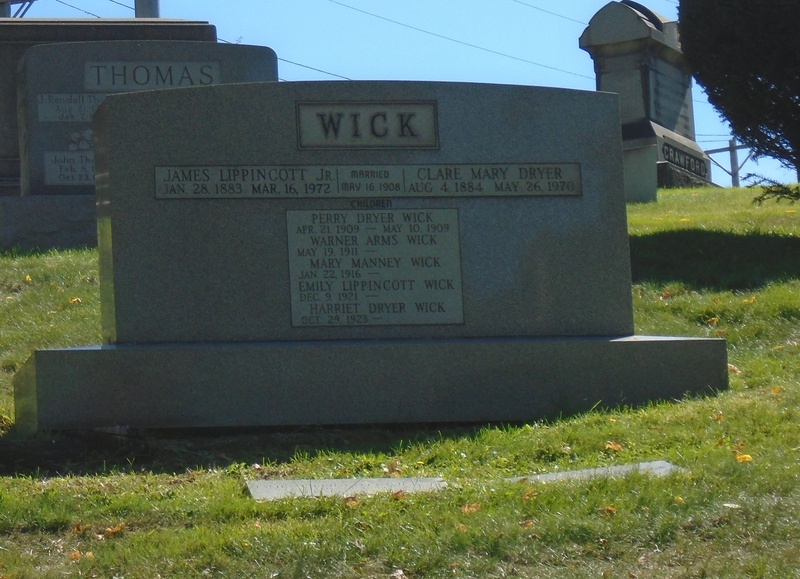 James L. Wick, Jr. was born January 28, 1883. He graduated from Massachusetts Institute of Technology, financed by an uncle. He went to work as a general master mechanic at Youngstown Sheet and Tube, then in 1918 took a position as secretary and assistant general manager of Falcon Bronze Company, a bronze foundry. By 1926 he was president, but only separated by a door from the plant where he helped pour a melt and sometimes operated a crane. Wick and Louis M. Nesselbush patented a cooling plate for inwalls and mantles in 1938. He sold the firm to American Brake Shoe Company in 1953. He played an important role in three Youngstown institutions. He was the chairman of the board of trustees of Youngstown College, later University from 1921 to 1955, overseeing its growth from a night school of the YMCA to a nationally accredited university. Jones Hall, the main building of the university was built under his tenure. Any of us who write about Youngstown history are indebted to the Mahoning Valley Historical Society. He was one of the incorporators of the Society in 1909 and served two terms as president. His most significant contribution was to help provide a permanent home for the Society and its growing archives. As its president, he persuaded Mrs. Wilford P. Arms to leave her home at 648 Wick Avenue to the society in 1961, and then sold lifetime memberships of $1,000 or more to endow the facility. He remained active with the Society until his death and had a passion for passing along the history of the Valley to its youth, and it was reported he was a lively storyteller. His other major passion was Mill Creek Park. He knew Volney Rogers, served on the Mill Creek Park board for 21 years until he retired in 1958, could identify trees and shrubs throughout the park, and fought to preserve the park when it was threatened by developers. After his retirement, Rocky Ridge was renamed in his honor, one he could easily visit just a short drive down S. Belle Vista from his home. He seems kind of a renaissance man. He was a gifted amateur painter, naturalist, inventor, and historian. He was a member of engineering societies, the Youngstown Country Club, a trustee of the Butler, and member of the board of First Presbyterian Church. I wish I had met him. He passed away on March 16, 1972, my senior year at Chaney. In the words of songwriter Joni Mitchell, “don’t it always seem to go that you don’t know what you’ve got ’til its gone.” I never knew this man, who contributed so much to Youngstown, and did so much that we might know its history, lived along my way to school. I’m glad I know a bit of him now. And perhaps by telling his story, and the story of our city, I can do my small bit to honor his legacy. Part of the Recipes of Youngstown Committee. From left to right: John Heasley, Bobbi Ennett Allen, Keith Evans, Ernie DiRenzo, JoAnn Donahue, Patty Gahagan Ruby, and Bobbie Snyder Chalky. Photo courtesy Cheryl Staib-Lewis. One of the most wonderful memories of growing up was to walk into the house at dinner time and to smell those wonderful smells emerging from the kitchen. It could be the herbs and special ingredients in mom’s spaghetti sauce, or the fried onions and garlic in the dish with sausage and peppers, or the delicious smell of that roast that has been simmering for hours and is so tender it melts in your mouth. For many of us in working class Youngstown, the kitchen was our favorite room of the house. Then there are all those special occasions–holiday baking or the week-long frenzy that goes into the perfect cookie table. There are all those big family gatherings–the perfect turkey, or ham or New Year’s Eve calamari. Some of us have inherited those favorite recipes and others of us wish we had. There is a chance to bring back all those memories, and all those delicious smells and tastes. Bobbi Ennett Allen and her Recipes of Youngstown crew are hosting “Memories of Mama’s Kitchen” on May 7 from noon to 4 pm at the Tyler History Center, in conjunction with Mother’s Day weekend. Bobbi and her team will wear old-fashioned aprons, offering tastings of 30 recipes from Recipes of Youngstown. You will have a chance to see the 1948 Youngstown Kitchen exhibit at the Tyler. There will be a basket raffle, a 50/50 drawing and a grand prize raffle. All this is being done with the hope of reaching the $50,000 goal for the Recipes of Youngstown Kitchen that will be dedicated at 2 pm. Cookbook sales, previous tastings, and pierogi and Brier Hill pizza sales have them oh-so close. Of course both the first and second Recipes of Youngstown will be available for sale. We have both and have bought a number for friends and family from Youngstown. They make great gifts. Your Youngstown friends will love you! So, if you are anywhere near Youngstown on May 7, make sure to take in this event, the culmination of efforts that began when a group of friends created a Facebook group and began sharing recipes. And if not, you can always buy Recipes 2 here and support the Mahoning Valley Historical Society’s Recipes of Youngstown kitchen.. It is wedding season again. And if you are from Youngstown, this also means that it is cookie table season again! 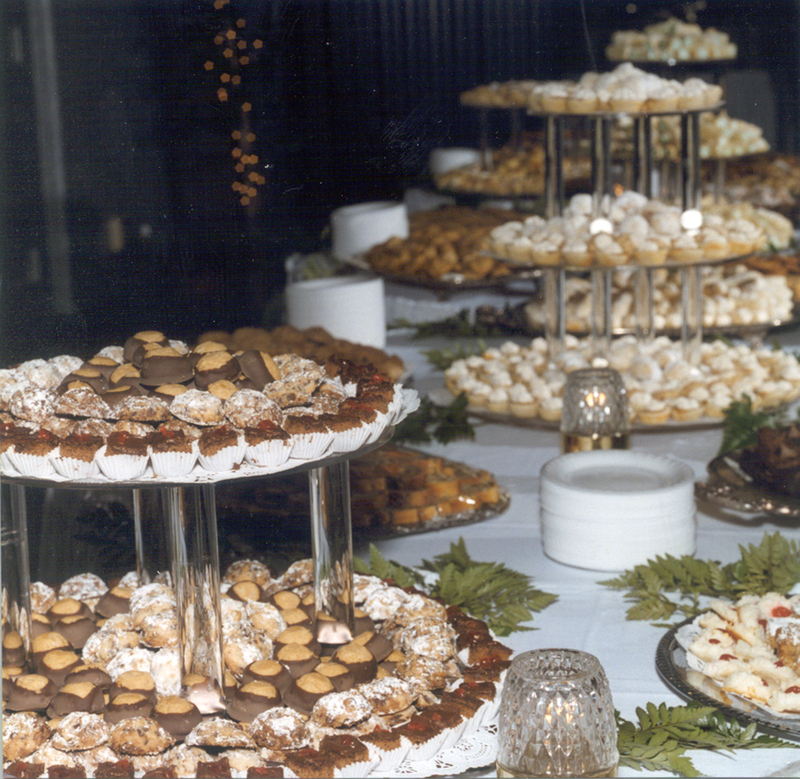 The cookie table is one of the distinctive wedding traditions of Youngstown. There is an ongoing dispute with Pittsburgh as to which was the city of origin of this dispute. A friend of mine from Pittsburgh and I settled this at a wedding (in Youngstown, with a fantastic cookie table) by arm-wrestling for the cookie table title. Youngstown was victorious–which for us Youngstowners was simply confirming the truth of what we already knew! Everything I’ve read about cookie tables proposes that the idea of cookie tables was born in depression-era working class families where it was just plain too expensive to buy a wedding cake. The tradition involves families and friends of the bride and group going into a baking frenzy in the weeks prior to the wedding making every imaginable cookie from clothes pins, to kolachi, to pizzelles, to peanut butter blossoms with Hershey kisses to Ohio’s favorite, the buckeye (peanut butter balls with butter, vanilla, and confectioners sugar mixed together and coated with chocolate on the sides preserving a peanut butter top–hence buckeye). The result are tables and tables of cookies available throughout the wedding reception. A considerate couple will provide snack bags so you can take home a stash (and with a good cookie table there is always plenty left over) that guests can nibble on over the next several days while having fond thoughts of the bride and groom. There is something I’ve been a bit curious about. My wife and I both grew up in Youngstown until moving away in the mid 1970s. And as we’ve talked and compared notes, we don’t remember cookie tables at weddings growing up, or at least cookie tables being the big deal they are at Youngstown wedding receptions now. I do remember lots of great food including the great ethnic dishes we are famous for. There was a cake, and maybe there were some cookies. But we both went to a number of weddings and we can’t honestly say that we remember this tradition from our growing up years. Perhaps we led sheltered lives and just missed the weddings where this was a big deal. I’d love for my friends from Youngstown who follow this blog to set me straight on this one, particularly if you have pictures from the 70s or earlier of cookie tables, or even some family memories. And I’d also be curious if there are others who are like us and can’t remember cookie tables until more recently. My hunch is that there were parts of the community that were doing this probably from at least the Depression. But I also wonder if there has been an embrace of this tradition over the last twenty to thirty years where it has truly become an all-Youngstown tradition and a point of pride for us. That this is true is clearly the case. I discovered that in the part of town where I grew up the Rocky Ridge Neighbors have a monthly cookie table. The Mahoning Valley Historical Society has an annual Cookie Table and Cocktails night with a cookie contest. There is even a new book of essays on Youngstown history coming out titled Car Bombs to Cookie Tables. Both Recipes of Youngstown and Recipes of Youngstown #2 have a number of cookie recipes good for cookie tables and other occasions. No Youngstown wedding these days is complete without a cookie table, and no wedding anywhere else quite measures up without one! Good community traditions are important in defining a community as a good place to live. This is one of our good ones. Even if it is one that I just didn’t know about, notice or remember growing up, the plain fact of the matter is that this is one of the things that makes Youngstown special and it is so good to see all the ways Youngstown is sustaining that tradition. The long awaited package of joy appeared in our mailbox on Thursday. Some months ago, we had learned that a new Recipes of Youngstown was in the works. Having been thoroughly delighted by the first volume, we didn’t hesitate for a moment to send in our pre-order. But we did find ourselves wondering whether after 500 recipes covering Youngstown staples from pierogies to pizzelles and chip-chopped ham to halushki, what was left? Not to worry, the contributors to this cookbook dug up from attics and cookbooks from grandparents a delightful and diverse plethora of new recipes. First the diversity. The last cookbook had a number of those Italian and Eastern European recipes as well as things like Idora fries that we all grew up with. This cookbook reflects a wider diversity of Turkish, Greek, Danish, German, Portuguese and Mexican recipes and more! Then there is the delightful part. I have always loved good Youngstown wedding soup and there are a couple of recipes, including one by the guiding force behind this enterprise, Bobbi Ennett Allen, with detailed instructions. I think even I could make a decent wedding soup with these! Patty’s Gazpacho looks to die for! I can almost taste “Uncle Tony’s Slow-Roasted Chipotle Pork Roast or Short Ribs”. Of course one of the reasons for a second cookbook is that there were many good recipes for making those dishes we love, from kolachis to clothespin cookies and lasagna to linguini. And one cool feature of this cookbook was that it preserved some of the Facebook comments that offered tips and variations on these recipes. This cookbook was truly a community effort. The cookbook is organized similarly to the previous edition with the following sections: In the Beginning (appetizers), Hot and Hearty (soups and stews), Sidelines (salads, sides, and veggies), Raised Right! (breads, rolls, and pizza), Gather ‘Round the Table (meats, casseroles, pasta, sauces, breakfast, and miscellaneous), Lunchbox (sandwiches), Something Old, Something New (cookies, candies and snacks), Youngstown Can! and Does! (canning and preserves), Youngstown Spirits Thrive! (Hooch), and a Sweet Ending (pastries, sweet breads, desserts, fillings and frostings). Is your mouth watering yet? One of the new additions to this cookbook were the illustrations of David Schwartz and the characters of Aunt Bessie and Uncle Guido. “Aunt Bessie was the one who showed up to care for the family when mom was under the weather….” Uncle Guido…”was the guy who let you have a sip of his beer; the guy who dumped your veggies into the trash along with his…”[from overleaf between pages 118-119]. Schwartz is a 1972 Rayen grad who went on to a great career in animation with Darkwing Duck, the Simpsons, Rugrats, The Flintstones among his credits. The proceeds from this cookbook will support another great Youngstown institution, the Mahoning Valley Historical Society and its “Recipes of Youngstown” kitchen in the Tyler History Center in downtown Youngstown. The great ethnic food traditions of Youngstown and the archive of recipes in this cookbook (and its predecessor) are a significant aspect of Youngstown history and culture. The partnership between the contributors (who came together first on Facebook) and the Historical Society are a wonderful opportunity to preserve this important piece of Youngstown history. As we’ve talked about so many times on this blog, no place does food like Youngstown and through these efforts, Youngstown will continue to be a place to get great food. Have you bought yours yet? If you want to order one, you can get one at the Mahoning Valley Historical Society website. And if you are in Youngstown today (May 2, 2015) make your way to downtown Youngstown for Recipes of Youngstown: A Taste…and a Memory at the Tyler History Center on Federal Street from Noon to 4 pm. There will be a tasting event with over 30 dishes from Recipes of Youngstown with raffles with some incredible prizes including a Kitchenaid mixer and an HDTV. All proceeds go to the Mahoning Valley Historical Society. Wish I could be there–but I have the cookbook! Happy eating, all! This and other Growing Up in Working Class Youngstown posts can be found by clicking “On Youngstown” on the menu bar on any page of the blog.